Use smart popup blocker helps you to surf more comfortably by block popup and block ADs ! Block Popup ADs - Smart Popup Blocker The annoying pop-up AD windows disturb your sights and occupy your system resource. How can you clear them? Ok,If you use the Smart Popup Blocker, the trouble will be gone.Smart Popup Blocker is an Block Popup & Block Ads product that can block 100% popup and block 100% ADs absolutely automatically while never interfere with user's navigation.While Smart Popup Blocker is running, it tells Internet Explorer to stop all unsolicited windows from being downloaded and appearing. 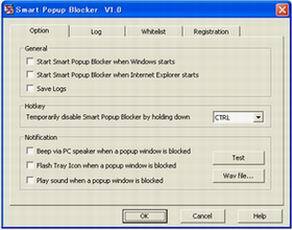 Smart Popup Blocker can block all pop-up windows even if the windows are very "clever". And Smart Popup Blocker also can block the windows that popup when you close your IE. Never see a pop-up again and enjoy your uninterrupted and peaceful surfing experience! After you installed the Smart Popup Blocker, you do not need to make any configure. When you start your Internet Explorer, Smart Popup Blocker will automatically works for you. It only affect you nothing except can not see the ad windows. Smart Popup Blocker is very smart. It only stop the pop-up ad windows other than the new windows that your open. So it has no effect when you open a hyperlink in new windows. Smart Popup Blocker will play warning sound and flash icon when it kill a pop-up window. With the industry leading popup blocking technology, Smart Popup Blocker works at a low level in the Internet Explorer engine - stopping a potential ad in it's tracks before it even has time to download. This prevents popup ads from stealing bandwidth from your other legitimate downloads to speed up your Internet. PopUp Ad Smasher - A Popup blocker to block popup, ADs easily, 100% Popup Ad Stopping Power!